While today, engineers can choose from a wide range of rheology modifying admixtures, in some parts of the world, these are difficult to access, due to their complex processing. However, alternatives can be bio-based polymers such as polysaccharides from various sources. These are easily accessible all over the world, do not demand for complicated processing, and typically they are more sustainable than many established materials, which are crude oil-based. The paper presents the effects of acacia gum, cassava starch and the gum of triumfetta pendrata A. Rich on the rheological performance of cementitious systems. 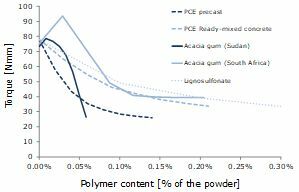 It is shown that acacia gum can be as efficient as polycarboxylate based superplasticisers, cassava starch can reduce the yield stress slightly with little effect on the plastic viscosity, and the gum of triumfetta pendrata A. Rich increases the thixotropy of cement pastes with plasticizing polymers significantly. Schmidt, W., Tchetgnia Ngassam, I., Olonade, K., Mbugua, R. and Kühne, H.-C. (2019) “Plant based chemical admixtures – potentials and effects on the performance of cementitious materials”, RILEM Technical Letters, 3, pp. 124-128. doi: 10.21809/rilemtechlett.2018.83.